I first learned about Peaceful Playgrounds (PP) as a classroom teacher over 10 years ago and heard about the resulting reduction in playground problems. Then I became I Principal of Pioneer Elementary in Escondido and realized that with a playground of less than 4 acres for a student population of over 1,000 students something needed to be done to maximize the time the students spent on the playground. I decided to try the PP program at Pioneer hoping our students would be more involved during recess time and therefore we would encounter fewer playground problems. Most students have not been exposed to many of the organized games that are the highlight of the PP program. To remedy this we had a member of the PP team in to train the staff at a half-day staff development day. She reviewed the structure and highlights of the program and stressed the importance of establishing rules and maintaining equipment for the students to remain consistently and positively engaged while on the playground. The trainer physically took the staff outside and trained them on how to play the games. It is important to “teach” the games to the students because kids won’t automatically know how to play. This key point is crucial for your student body since so many students live in apartments with limited opportunities for them to learn to play activities such as hopscotch. This year we plan to use our Monday morning announcements to highlight a Peaceful Playgrounds game of the month and videotape students playing a given game and as a result we anticipate a reduction in playground problems. We will have the students model how the game is played as we go through the directions. These games will be highlighted at the beginning of the month when a new track returns from their vacation. Also, we plan to have our Peace Patrol students engaged in those games. Our supervision staff will be encouraged to reward students playing those games with a “Caught Being Good” ticket. We are excited about the Peaceful Playground program at Pioneer Elementary. It gives our students structured games to engage in and allows them to learn skills that they would not otherwise have the opportunity to learn. 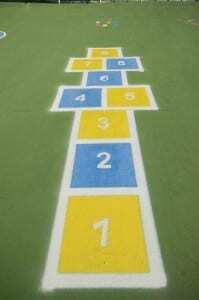 It has reduced the number of discipline problems on our playground. It has been especially helpful to our new staff members as it enhances their Physical Education program. Editor’s note: Peaceful Playground program information and materials are available by contacting Peaceful Playgrounds at 1-877-444-9888.